Full disclosure: I’m on Chronicle Books Gold Reviewer Panel for their YA books. Recently I was flying to NYC and read a chunk of PRISONERS IN THE PALACE by Michaela MacColl on my 5-hour flight from California. A few days later, my in-laws were watching the movie, Young Victoria, starring Emily Blunt, and I was excited that I knew about young Queen Victoria’s life from the book I was reading. MacColl tells the story of teenage Victoria before she ascends to the throne as Queen as told through the eyes of her maid Liza. 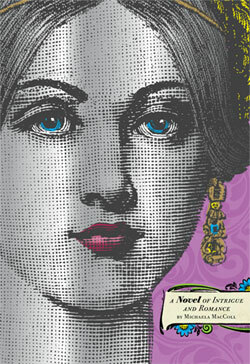 Set in London in 1836, Liza becomes an orphan after her parents die in a tragic accident. With her father’s debts mounting, Liza seeks out employment in Kensington Palace and lands a position as Victoria’s maid. The two become friends over the course of the book and Liza meets a cast of characters in the Palace, some who are are aligning themselves for key positions in the court by blackmailing the princess and others who are looking out for Victoria’s well-being. While I’m not a huge fan of historical fiction, it should be noted that MacColl does an excellent job of incorporating real historical facts into both Liza and Victoria’s coming-of-age story. Excerpts from actual journal entries Victoria wrote (she had written over 100 volumes of journals by the time she died) and Victoria’s mother’s letters from that time period are ways readers get clued into what palace life must have been like for a young woman. The writing is fun, with mixtures of newspaper clippings, journal entries from Liza and Victoria, and letters, which tell the many different stories from the different characters involved. What should be admired is that MacColl has crafted these two young women — Liza and Princess Victoria — to be strong young women who learn how to be self-sufficient in a time when women were not considered to be worth much. At times, the writing can be a little obvious instead of original, particularly in more dramatic moments like when Liza discovers what has happened to the previous maid in her exact position. But overall, MacColl translates the royal world into a relatable tale of what every young girl feels like when she’s on the cusp of becoming a woman. Be sure to read the Author’s Note at the end, which details what characters are true to life and what history MacColl used in the book. After you get to know the cast of characters, it’s quite fascinating to read the real inspirations behind them. PRISONERS IN THE PALACE is available now in bookstores and on Chronicle Books’ website.